The modern version of the y-branch used when we were kids. This version is lighter and stronger and much more accurate. 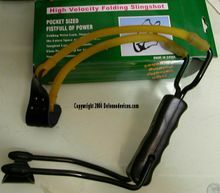 This folding slingshot has surgical gum rubber slings and leather pouch attached to a lightweight metal frame with wrist support (that folds flat to fit in your pocket) to ensure your steady aim. Will launch your ammo over 100 yards with great accuracy. Weighs 7.5 oz. and is 7 inches tall. A great tool for survival or fun. Not available for sale to MA or NY.